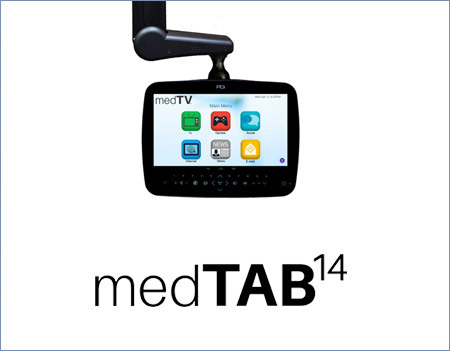 medTAB is the best way to deliver the medTV experience.The 14” medTAB brings the standard TV and the freedom of the world wide web together in one device. Give patients the comforts of home with the ability to surf the web, play games, connect to friends and family and more - with an interface that’s easy to navigate and fun to engage with. Bring a home-like experience to the patients fingertips. With just a few taps patients can access apps, games and more! The patient will never experience downtime with direct ethernet connection and preloaded content should WIFI ever fail. Never worry about patient privacy. medTABs are configured to have multi-user password protections or can be setup to automatically erase user data when the patient is discharged. Fast, easy set up. Out of the box. The pre-loaded interactive patient software is ready for patient use in minutes. Simply install the hardware, power on, register the device and its ready for use. Meet your facility’s initiatives and maximize CMS reimbursements by satisfying and empowering patients with a scalable solution designed to improve patient experience. Create a comfortable & interactive environment centered around the patient. Provide patient education, relaxation apps, communication channels and more. Contact us to learn more! Multi-user restricted patient profiles. Can automatically wipe user data. Patient engagement, patient education, and expanded entertainment are within reach. medTV brings standard TV and the freedom of the world wide web together in one device. The simple, integrated Interactive Patient System solution comes out of the box and is ready for patient use within minutes of set-up. Give patients the comforts of home with the ability to surf the web, play games, connect to their friends and family and more with software that is easy to navigate and fun to engage with.